The technique for creating cabled sweaters is to move a set of stitches behind or in front of others to twist them around each other. These metal cable needles are designed to securely hold stitches out of the way while you move other stitches around them. The bulky needle (A) is perfect for the chunky yarns that are so popular. 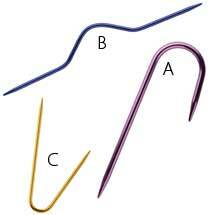 If you are using traditionally sized yarn, the center scoop needle (B) works well. The regular needle (C) hangs down taking up less room when you are working on socks or sleeves. Note: Colors may vary from what is pictured. I bought one of the "regular" bent needles. It works great! I let a friend borrow it & she liked it much better than the straight with a hickey needles she had been using. You pick up the stitches with the shorter end & knit them off the long end. No twisting stitches. I bought 4 more in case I should lose the one I have. That is how much I like it. I do not find these user friendly at all. I prefer the wooden cable holders. I have a regular cable needle from another brand, but was interested to try out the Center Scoop style to see if it was less fiddly for me to work with. I was surprised to find that this center scoop needle is 4.5" long. I was expecting something half that size. (I had a smaller one years ago and have since lost it.) As such, it will most likely get in the way while I'm trying to cable on socks using dpns. It also won't fit in the tin I use to keep my notions. Seems like a good needle though and high quality, just not what I expected. I really think the length should be added to the product description.